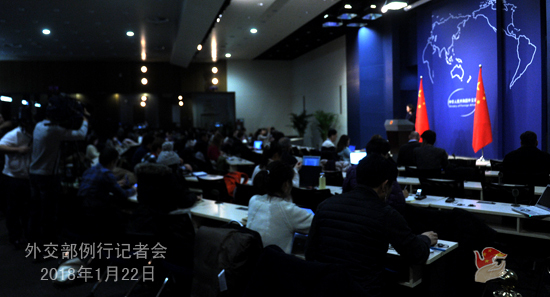 Q: According to reports, the US Department of Defense published the 2018 National Defense Strategy Summary recently, which made much criticism on China and said that China's strategic intention in the future is to seek displacement of the United States to achieve global preeminence in the future. What's your comment? 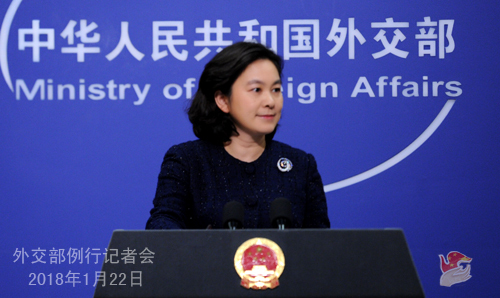 A: The Spokesperson of China's Defense Ministry already stated China's solemn position on this US report on January 20. I believe you are all aware of that. This above-mentioned report is full of the outdated cold-war mentality and zero-sum game mindset, which intentionally distorts China's foreign and national defense policies and plays up strategic competition between major countries. This is fundamentally wrong. Unswervingly sticking to the path of peaceful development and following a national defense policy that is defensive in nature, China has always been the builder of world peace, contributor to global development and defender of international order, which is there for all to see. Who is really applying international rules in a selective way? Who is wantonly interfering in other countries' internal affairs and even resorting to the threat of force? I believe people around the world can see that clearly and have their fair judgment. We hope the US will discard the cold-war mentality, put the world today and China-US relations in perspective, stop distorting China's strategic intention, and work for the shared goal with China. We need to respect each other, focus on cooperation and manage differences in an effort to uphold the long-term sound and steady development of China-US relations. This is truly the right choice that serves the interests of both China and the US and the world at large. Q: According to reports, a US government official said on Friday that the US mistakenly supported China's membership to the WTO, which has failed to open China's economy. What is your comment? A: Since its accession into the WTO, China has strictly observed the organization's rules, faithfully fulfilled its obligations and made important contributions to the effective functioning and development of the multilateral trading system. Moreover, other countries have benefited from their trade with China. 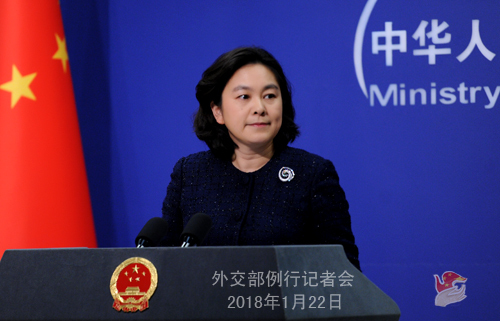 China has always been committed to the path of reform and opening-up, firmly supporting an open world economy, continuously improving business environment as well as upholding, building and contributing to the multilateral trading system. In fact, there is wide approval among the WTO members of China's commitment to the multilateral trading system and they look forward to a bigger role played by China in the system. At the same time, as we all can see, it is exactly the US that acts and speaks in a unilateral manner and poses an unprecedented challenge to the multilateral trading system, over which many WTO members have expressed their concern. We hope the US can look at China correctly and take concrete actions to uphold the multilateral trading system. As we said many times, the trade between China and the US is mutually beneficial and win-win in essence. As important members of the WTO, both China and the US should jointly uphold the authority of the WTO rules and improve the fair, open and rules-based multilateral trading system with the WTO at its core. Q: According to reports, Indonesian Defense Minister Ryamizard Ryacudu said at the Raisina Dialogue recently that the situation in the South China Sea has eased, and the momentum needs to be maintained in a favorable way for the sake of common interests. He also added that we need to appreciate China's goodwill in opening itself and readiness to work together in strengthening the regional security architecture in Asia. What's your comment? A: China appreciates relevant remarks by the Indonesian Defense Minister. As a Chinese saying goes, "treat others with sincerity and you will be treated the same way in return". This fully testifies to the willingness of China and ASEAN countries to jointly uphold peace and stability in the South China Sea. The trust between China and ASEAN countries is so precious and the stability in the South China Sea is a hard-won outcome. Guided by the principle of comprehensive and effective implementation of the Declaration on the Conduct of Parties in the South China Sea (DOC), China stands ready to continue to work with relevant parties to vigorously advance the consultation on the Code of Conduct in the South China Sea (COC) and maritime practical cooperation and commit ourselves to upholding peace, stability, prosperity and development in the South China Sea. Q: We have noted that the Japanese TV station NHK broadcast a documentary on Unit 731, which revealed its hideous crimes of secretly conducting living-body experiments and developing bacteriological weapons in the Northeast of China. What's your comment on this? A: During World War II, the invading Japanese troops waged a heinous germ warfare against the Chinese people. The relevant evidence is ironclad and undeniable. We appreciate the courage of those insightful Japanese people to reveal the historical truth and hope the Japanese side can carefully listen to the call for justice at home and abroad, correctly understand and deeply reflect upon the history of aggression by the Japanese militarism, and earnestly respect the feelings of the Chinese people and people of other victimized Asian countries.